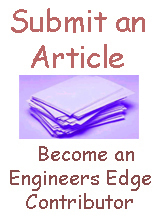 Engineers Edge needs your opinions and ideas to better serve you and keep up with engineering and design activities. We encourage visitors to tell us how we're doing and let us know about projects, industry trends and interesting developments at your company or in your area. We plan to publish letters and start an online dialogue in the future, so tell us what's on your mind. In order to continue bringing you the information in our Web Pages, we would like to receive information about you. This allows us to compile demographic information for new and potential advertisers and tell them who's benefiting from our web resources. We won't give or sell your name and address to anyone. Subject you are commenting on? Web page address you are commenting on? E-mail We will never spam you!